Creativity, quality and originality. Eaglemoss is proud of its record in producing exceptional partworks and collections, from unique build-ups and exceptional figurine collections to creative and fun childrens' titles, Eaglemoss excels in producing quality titles. 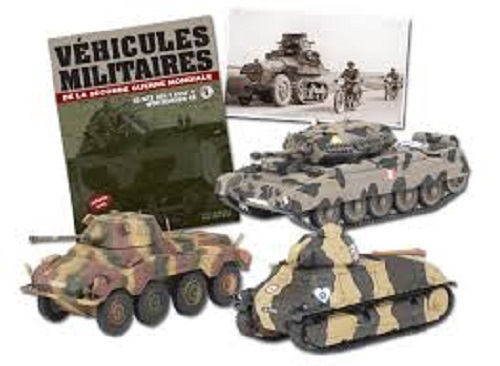 Their Military Vehicles of the Second World War collection comprises over 70 vehicles. One of the nice things about our new site is that it now allows us to highlight some of the more noteworthy items being released by each manufacturer. In the case of Eaglemoss Collections, what follows is a list of some of the more intriguing products that have just arrived which we feel would be of interest to the savvy collector. The AMC Schneider P 16, also known as the AMC Citron-Kgresse Modle 1929 or the Panhard-Schneider P16, was a half-track that was designed for the French Army before World War II. The U23, or Type 23, was a light (2-ton) truck introduced by Citron in 1936. Although the engine cowling and front body was looking similar with the Citron Traction Avant's, the U23 had a conventional rear-drive transmission. The Sd. Kfz. 250 was a light armored halftrack, very similar in appearance to the larger Hanomag-designed Sdkfz 251, and built by the DEMAG firm, for use by Nazi Germany in World War II. The 250 had 4 roadwheels and a cargo capacity of one ton. The 3/4 ton command car was used to provide transportation for staff officers in the field. Able to reach a top governed speed of 54-mph, it was designed to tow a load over unimproved roads, trails and open, rolling and hilly cross country. To support its mobile concept of modern warfare, Germany introduced a wide range of tracked and wheeled armored vehicles. One wheeled family of vehicles introduced in 1936 included 4x4 armored cars known as the, which translates as Light Armored Reconnaissance Vehicle. The ZIS-6 is a Soviet general purpose 64 army cargo truck, a three-axle version of the ZIS-5 two-axle truck. It was built from 1933 until October 1941 at the Moscow Zavod imeni Stalina factory and reached a total production of 21,239. Having commissioned Willys, Ford and Bantam to build 4,500 jeeps (1,500 apiece) in March 1941, the US Motor Transport Board set up a project under the direction of the National Defense Research Committee (NDRC) to be designated QMC-4 1/4 ton amphibian. The Peugeot DMA was a light truck built by Peugeot between 1941 and 1948. It was the first commercial vehicle from Peugeot to employ a forward control cab, whereby the driver sat right at the front of the vehicle.